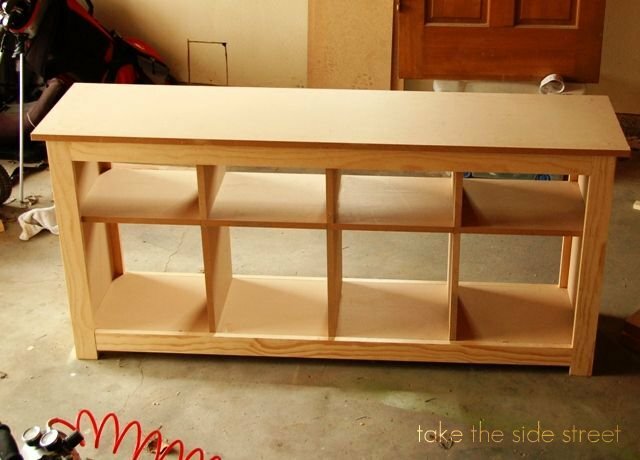 Take the Side Street: Tiny DIY Fail: Sound Off! Tiny DIY Fail: Sound Off! What I'm sharing today definitely doesn't count as a giant FAIL in the classic sense, although I've had my fair share of those, all of which stem from the fact that I know what I'm doing only about 7.5% of the time. Eh, fake it 'til you make it, right? I finally got tired of waiting, even though the trees are all still bare here in Narnia my town and the near constant wind is insisting on ruining my best laid dress-wearing-cute-hair plans. It's sort of springy... kind of. Temperatures in the low 40's count, right? This week I built my sofa table, and it looks nice except for one thing...the legs. Oy, the legs. Or "squatty toadstool hooves," as I lovingly call them. You see, I changed some things to "The Plan" last minute and I thought I had adjusted everything but forgot to adjust the leg length to reflect the wider trim. So now instead of a few inches of leg showing at the bottom, I was left with those. Bah. I am thinking about cutting some extra pieces of wood just an inch or two long and carefully adding them to the bottom, then puttying and sanding the heck out of them with my magic seam-disappearing skills. Like permanent elevator shoes for my table. I don't want it to be crazy tall, just a teensy bit leggier. I've got carpet, guys! Those suckers will literally disappear and I'll have a miraculously floating squat table behind my couch if I don't do something. Also, please know that if I do decide to add some length to the legs, by the time I share the plan and instructions with you I will have meticulously updated "The Plan" to reflect the new, improved measurements. That way my sofa table will be the only one needing therapy for its height issues. I don't like building stuff that much, dude. No thanks. Maybe you could get those and screw them to the bottom of your leg..
Ok so here's my brilliant plan. As soon as I saw those legs I thought...they'd look great with casters! Why not buy some chunky big casters and put those on the bottom of the legs?? It'd raise them up an additional few inches and you could lock the wheels but it'd make it super easy to move the room around if you want to! Oh and I didn't mention that you did an AHHHMAAZING job on the table. Its gorgeous!!!!!! I've been looking for a sofa table on CL for EVAH! Great great job! OMG...your table looks FAB-U-LOUS (said with a sing-songy voice). I don't think you need to change a thing...you should be so proud that you MADE that and it looks just like a store bought piece of furniture...but better, because you MADE it! Can't wait to see your finish on it!! Lowes has all kinds of feet for projects like that. I bought bun feet for a tv stand but they do have several different styles and items for just that kind of project but I think its cute. I actually took the bottom part off of our media stand so it sat on the floor. No dusting under it now. I love it. I wouldn't change a thing. I think it looks great and you are making a mountain out of a mole hill, so to say. You could change it, certainly, if you wanted to - but it's awesome as is! I actually love it. I think because of the storage units it looks great with short feet - legs. Might it look kind of top heavy with longer legs?? I'm sure whatever you decide it will look great, but I love it as is. Good job! What paint treatment are you doing? I assume you are painting and not staining but either way this will add some weight to the bottom. 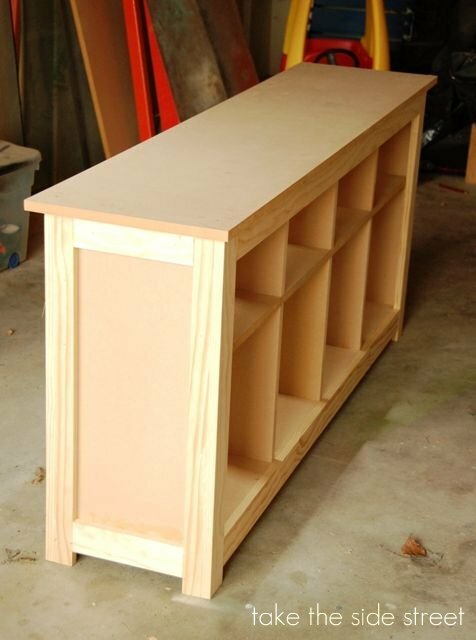 Why don't you paint/stain one to two shades darker around the bottom trim? It will make the bottom look heavier than the top so it will give it some grounding effects. Good luck and girlie I love it! I also just discovered your blog and LOVE it, and I agree with Jenny...when I looked at the Hemnes table I instantly thought about how much I liked yours better. Yours seems to have thicker lines and just looks sturdier! I also like the short legs!! You are awesome...I'm so glad to see all of these women (I also just discovered Ana White this weekend) building beautiful furniture because it makes me realize that my extravagant, sometimes over-ambitious ideas and plans are things that I can actually accomplish with success!